I have not grown up with Christmas cut-out cookies. My mother and I made such delights as shortbread. Gingersnaps. Ribbon cookies and Raspberry Meringue Kisses which are both too hard to explain here, but we did not roll out dough or frost cookies in bright colors. They are best with just a sprinkling of raw sugar. As well as a stick of peppermint if you have it. Mix together thoroughly 1 C. soft butter, 1/2 C. sugar, 1 egg. Sift together and stir in 3 C. flour, 1/2 tsp. baking powder. Chill dough. Roll very thin. Cut into desired shapes. Place on ungreased baking sheet. If glazed cookie is desired, brush mixture of 1 egg yolk and 2 T. water over top of cookies before baking. Bake at 425F for 5 to 7 minutes. Makes about 7 dozen, 2″ cookies. Special thanks to Sara for sponsoring this cookie recipe exchange. 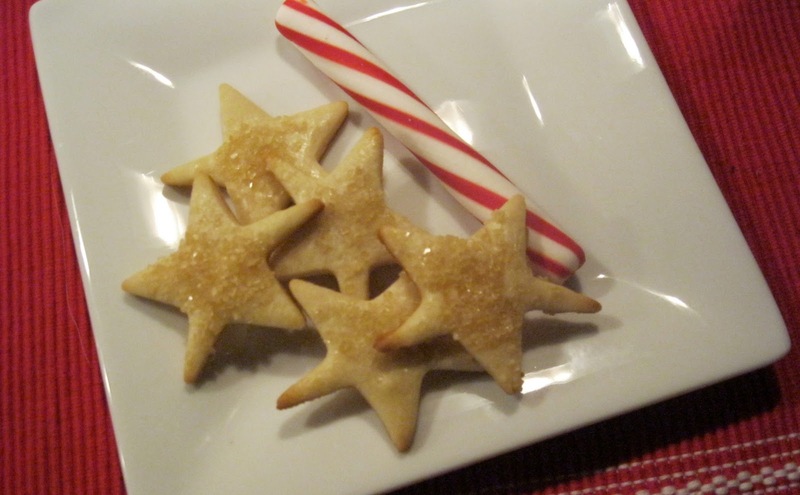 If I had to pick just ONE cookie to eat, it would be a sugar cookie…and these sound so good. I am not an icing girl (though my family loves the ones in my post), so the raw sugar on these sounds yummy!! !Thanks for joining in! This may be the year I do the cut-out cookies Mom used to make for me – and to leave for Santa. They were just extraorindary – you pressed the sugar cookie dough into the red plastic cutters, effectively embossing the cookies as well as cutting them. I still have the cutters and their original box and instructions – "Aunt Chick's Cookies", from Tulsa, OK.The highlight was Santa, with a cute nose, round cheeks, bushy eyebrows and a festive hat – about 5" tall. Mom painted his cheeks red, gave him raisin eyes and frosting eyebrows, a coconut beard and… and…I think I'd better make those cookies for her, don't you? I'm with Sara, I love sugar cookies without frosting. What a great idea to sprinkle on the raw sugar! Great idea! Can I steal your phrase of butter as a food group? I'm a huge butter fan too. Delicious cookies. We've been making the same sugar cookie recipe (which came with this weird cookie cutter roller that never worked) since Lee and I got married. It's a strange recipe too — you dissolve the baking powder in milk, rather than adding it to the dry ingredients. They are the first to go on the Christmas cookie list every year. Glad yours came out so beautifully! I am totally delighted with your blog. Your beatiful post about cookies invited me in to read more and I couldn't pull away. Yes, butter is indeed a marvelous food group. I look forward to getting to know you. I'm just zipping around the blogosphere, reminding bloggers…If you have read any wonderful literary bookspublished in 2010, I urge you to nominate your favoritesfor The Independent Literary Awards. The awardsinclude categories of Literary Fiction and Literary Non-Fiction. I'm especially interested in having some great nominees for nonfiction! I'm ALL with you….butter is my primary food group too. Then sugar… heheh….I love the photo of the old cookbook…..I think I grew up with that one, it was my mom's! Hugs, HeidiI make roll-out sugar cookies ALL the time, don't even bother to frost them most days! These sound like great sugar cookies. I love them withfrosting and sprinkles !!! Thanks for all these Christmas posts… simply delicious! Yum! These look gorgeous and delicious! These look so pretty. I have that same cookbook (have had it forever) and should try that recipe! This is what happens when I take a blogging break! I miss out on a cookie exchange? I wonder if I might have a similar Betty Crocker book. I know mine is a bit older (at least 70s because it talks about "new" microwave recipes), but I'll have to see if there's one in my book. We just had our annual family bake day on Saturday, but I might NEED to sneak in some additional butter cookies as well. These look beautiful.